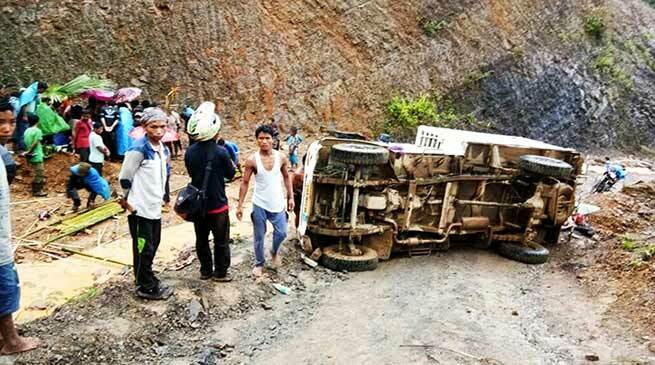 One persons died and two injured as the truck they were travelling roll down at the hill road between Tewai-Wanu, on NH52-B Trans Arunachal highway. The accident took place on Thursday noon. When the truck rolled, all the people were fall into the ground who were came from kanubari market. Amongst all these three people were serious injured and took into CHC kanubari by EAC kanubari, who came from longding. Unfortunately after reaching CHC kanubari, one person has stop his breath and he was identified as Ngakwang wangham, one of the chief of wanu. Others two people were referred to dibrugarh medical, Assam for further treatment. The people of the civil society strongly condemned the act of accident because it is occurring due to the bad road conditions. In an another accident a Maruti car collided with an another Maruti car in between Nirjuli to Doimukh road on Saturday morning. According the local people, both the drivers were not maintaining road divider lane , causing the accident took place.